Today we're going to talk about bitcoin the future is probably the most requested topic for me to talk about in the past week or two especially because a lot of the rise recently in Bitcoin has been attributed to hype behind bitcoin futures and an increased amount of liquidity coming into the market from institutional investors and a lot of people are asking me Is price going to go up as a result of bitcoin futures coming and is it going to go down as a result of bitcoin future is being launched. Is it good for bitcoin. Is it bad for bitcoin is Wall Street going to start manipulating it. What's going to happen over the short term and what are my thoughts on the long term. So today we're going to talk about what the effect of bitcoin futures should be on Bitcoin now. First of all I will say that I think a lot of people expect a huge pump of liquidity into the market starting tomorrow when these futures launch on the Chicago Board Options Exchange and then next week when they launch for a group. However I want to level expectations just a little bit here because I want you to remember that the majority of people that will be investing in bitcoin futures are going to be institutional investors. It's going to be accredited investors and it's going to be brokers on the behalf of wealthy clients in a lot of times it's not going to be the retail investor that is investing in futures mostly because number one they don't have enough money for the initial margin requirement especially in the case of CME Group futures. and then also the fact that it's usually more complex than most people are able to understand. And as a result of that most people stay away from it. So the majority of people that are going to be investing in these futures as people mostly already know is going to be wealthy individuals as well as institutional investors. What the result of this is that those types of investors tend to be a little bit more cautious and they're probably going to wait for the first expiration date and really have the first cycle go by where they understand how the volatility works. They understand whether or not the initial margin requirements were set high enough to actually make sense for bitcoin futures because I will tell you there's already been a number of criticisms as to whether or not margin requirements are high enough and I already know that a number of different brokers such as interactive brokers are actually going to implement a higher initial margin requirement than what is required by the Chicago Board Options Exchange as well as CME Group. For those of you that are unfamiliar with what initial margin requirement is it essentially says that you have to make a deposit in good faith that will be debited and credited. And this I know this is going to sound like complete nonsense to the majority of you. The simplest way to understand it is that you need to deposit a certain percentage of the worth of the contract. So in the case of Chicago Board Options Exchange one contract is going to be one bitcoin which makes it so that it actually is somewhat available to retail investors. Let's say the initial margin requirement is 40 percent. I believe it's closer to 45 percent for Chicago Board Options Exchange if I'm going off the top of my head here. If it's 40 percent then you're going to be required at this point to put in 40 percent fourteen thousand eight hundred eighty six dollars. Now it's actually not going to be exactly that because they use a different reference price than jete X. They're actually going to use Gemini and they're not actually going to use the Gemini exchange but rather they're going to use a price index that the Gemini exchange has created for them. So the point is though you have to put down 40 percent of the worth of a single contract for you to own the contract. After that every single day depending on the price fluctuations of the contract you're either going to lose some money from that deposit or gain some money from that deposit depending on whether or not the contract went against you or in your favor. So let's say you weren't long on a contract. What is going long on a contract. Mean it essentially means and this is actually not entirely true. But this is the easiest way to understand it it's that you agree to purchase bitcoin in the future at a certain price. And going short on a contract means that you agree to sell bitcoin at a certain price in the future. Now it actually doesn't work exactly like that because it's cash settlement which means you're actually going to be paying. And I'm not going to go too much into this because it's I don't know how to explain it in a very easy layman way. But essentially instead of doing it so that you're delivering actual bitcoin what's going to happen instead is on the settlement of the contract. In other words when that day happens in other words this is going to be the first expiration here it's going to be January 17th for the Chicago Board Options Exchange on that particular day. Let's say you and I go into a contract right now and I agree to buy bitcoin from you in the future on this date. Fifteen thousand dollars. Let's say on that date the price is sixteen thousand dollars instead of you selling me a bitcoin for fifteen thousand dollars. Instead what we're going to do is we're going to have it so that you actually pay me a thousand dollars and you lose a thousand. Right. So in other words out of that initial deposit that I make I'm going to gain a thousand dollars and you're going to lose a thousand dollars. It's going to be net neutral in terms of the overall contract and that contract will be settled. And that might seem counter-intuitive to a lot of people but then I could actually go out on the market and purchase effectively a bitcoin for 15000 and you might be saying how is that possible. Well because I made a thousand dollars worth of profit that's going to cut away from the sixteen thousand dollar price that it is on that particular date. So I hope that sort of makes sense. I know it's not exactly the most intuitive thing in the world but it's the best way I have to explain it. If you don't understand it after I just did my explanation there then what I would encourage you to do is look up cash settlement and there's going to be a ton of different articles out there that talk about futures and I'm pretty sure investopedia probably has one. They're my source whenever I have a question about investing. So I would really encourage you to check them out. If you ever do have a question about how futures work anyway. So now you have a basic understanding those initial margin requirements are very important because it ensures that you're actually able to pay out to the other counterparty in the contract. Remember that every contract has somebody that goes along somebody that agrees the buyback when in the future and they always have somebody that goes short somebody that agrees to sell bitcoin in the future at a certain price and as a result of that every single day there's going to be a new settlement almost in other words every single day the cash balances are going to change based off of the change in the prices that the futures and you'll be able to find that pricing data on a number of different exchanges as well as brokers. And of course Chicago Board Options Exchange as well as Seameo group will offer you those quotes themselves. For example you can see here this is the future quotes for CME Group. Of course they're not live yet but this is one place in which you will actually be able to tell how those are actually changing day to day. Anyway the point of all of this is that those initial margin requirements are going to be changing very rapidly I think depending on whether or not bitcoin is very volatile or not too volatile. And we're also probably going to see the maintenance margin requirements change rapidly as well. From broker to broker and again some brokers are not going to allow you to even go short on those future contracts in other words you're not going to be allowed to sell bitcoin in the future or of course you're not actually selling bitcoin you're not going be able to settle in the future with cash using certain brokers. And I'm pretty sure Interactive Brokers is one of them and they're one of the best brokers out there. So I want to be very clear about this. It does depend on where you go and everybody in the industry at the moment is very cautious about bitcoin futures. So if you're expecting a huge pump of liquidity into this market I will tell you that for the first expiration right until we get to that first expiration date it's probably not going to be as much liquidity as you might expect. So I would level your expectations a little bit here. And I also will say this I think that because we aren't going to see the huge pump of liquidity most likely I don't this might be a sell the news type event. I don't know if it's going to happen with the Chicago Board Options Exchange launch because of course they're much smaller than CME Group if CME Group. When they launched it the liquidity is not that high that I would expect bitcoin to do a fairly healthy correction. Okay especially if a lot of this buildup was the result of anticipation for these futures. Now as to whether or not futures are good for bitcoin are bad for bitcoin they're absolutely good. OK a lot of people are speculative that it's going to result in Wall Street manipulating the price of coin and that's certainly possible to a certain extent. However there are position size limits although they're fairly large. They're going to be in the case of CME Group it's going to be a thousand contracts if I recall correctly probably have that in here somewhere. There you go. So you have a limit of a thousand contracts and then you have 5000 contracts I believe for the Chicago Board Options Exchange which means it's still being able to control 5000 bitcoin is plenty of money. I don't know exactly how much that works out to be at the moment I believe that 75 million dollars. So that's a fair chunk of change. All of this is to say though I do think that futures often offer higher liquidity in markets maybe not during this first month. It will offer more liquidity but it may not be as much as people expect however in the long term here I think that the increased liquidity into bitcoin is going to result in a much more efficient pricing of Bitcoin. It's going to result in much better price discovery for bitcoin. Basically matching supply and demand and we are going to see I think arbitrage opportunities in the Bitcoin market are actually going to start decreasing as a result of this. We've seen situations where jete X for example recently went all the way up to nineteen thousand seven hundred but I believe Gemini and some of the other U.S. exchanges only went up too. And I'm going based off of memory here but somewhere around like 17000 think 500 or so it was like 2000 dollars lower than GTAC was right. I don't think those opportunities are going to exist as much anymore because people are basically going to arbitrage between the spot price of bitcoin and then the future contract price of bitcoin. And it's going to result in people that essentially I think we're going to have a much more efficient market. I think we're going to see higher liquidity which is going to result in better pricing and Peer coin it's probably going to become less volatile in the long term. It is interesting to note that of course because even though initial margin requirements are going to be fairly high it is going to introduce leverage into the Bitcoin market which is always going to be very interesting. Right. If you have an initial margin requirement of 50 percent then that's the equivalent of being able to control over twice. Well not over twice exactly twice the amount of bitcoin that you could otherwise if you had bought it outright. So it is worth noting that Bitcoin futures are going to introduce much more leverage into the market. On the flip side it's going to increase liquidity probably increase the efficiency of the market which means we're going to see lower arbitrage opportunity between exchanges which means we're going to have a more efficient pricing market which means in the long term here volatility should decrease again. I think in the short term here we are going to see volatility probably increase just a tad again introducing leverage into a market like Bitcoin cannot possibly and in anything other than volatility. Okay seriously. So it is going to be interesting watching this over the coming weeks or so. I would encourage you not to touch bitcoin futures at least in the beginning I would be very cautious about it unless you're already experienced with futures and you understand perfectly well how they work and how speculative they can be and still you understand them I would not touch them. OK plain and simple. So if this is your first experience with futures especially if you've never had any experience with purchasing stock I wouldn't even bother with futures. Okay. Very clear about this. Please do not touch fut. unless you're an experienced ambassador and you know what you are doing and most of you can't even touch futures anyway because the initial margin requirement is going to be too high especially if bitcoins price continues going up. So anyway I just wanted to get my thoughts on bitcoin futures here. I think it's going to cause prices to go down in the short term here because I don't think there's going to be as much liquidity as people expect. And I've also noticed that Bitcoin tends to be a sell the news type environment. In fact all the crypto currencies tend to buy the rumor sell the news or buy the hype sell the news. It's never about the actual news that seems to be a catalyst. So it always seems they get a head of where it should be for a particular news event and then the news event happens and nothing happens with price. So at this point in time I'm not that bullish on Bitcoin. I do have a small position in it but I don't. I'm not going to have a high position or anything like that. I'm not buying bitcoin going into the futures and I will probably be very cautious about bitcoin over the next month or so as we watch these futures play out. You are going to want to watch them very closely see the number of contracts that are being traded. The volume and whether or not it seems like institutional investors are jumping on to them or if they're staying away and being cautious we also want to pay attention to how many times price limits get hit. For those of you that are unfamiliar there are in fact going to be limits that are set in place so that if bitcoin moves over a certain amount in a day we are going to see it essentially freeze at different levels. 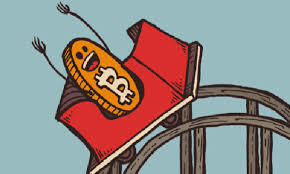 And finally trading will be halted altogether if bitcoins price moves 20 percent or more in either direction which actually would have been triggered on this particular day. Right. So I do. It's going to be very interesting watching what happens with bitcoin futures. I would say it's not going to be nearly as exciting. Rather I don't think it's going to affect price in a positive way as much as people anticipate. However I think in the long term futures are excellent because it's going to help settle a market or create a market based off of bitcoin that is much more stable in the long term of course I don't think it's going to be true in the short term cure. But we are going to see in the long term this is going to establish a market with higher liquidity more efficient pricing which is going to result I think in a higher probability that we see a bitcoin ETF approved. And if we see a bitcoin ETF approved you can bet a ton of capital will come into bitcoin regardless of whether or not it makes any sense. So I hope you guys enjoy this Article. Let me know your thoughts on bitcoin futures as usual. If you would like to support me Otherwise leave a like comment and subscription and I will get back to you as soon as possible.